Cameron M. Smith is a prehistorian at Portland State University. In his spare time he builds pressure suits for private space expeditions as founder of Pacific Spaceflight, the US arm of Copenhagen Suborbitals. Cameron M. Smith of Pacific Spaceflight / Copenhagen Suborbitals in the Mark I ‘Gagarin’ Pressure Garment. 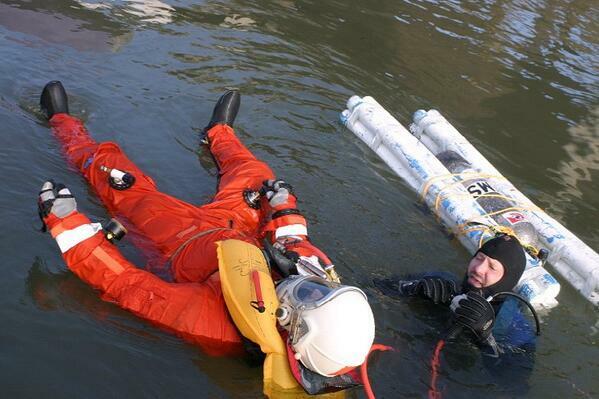 Photo: Jev Olsen, Copenhagen Suborbitals. A hundred and forty days from now I’ll clamber into a balloon gondola, garbed in a pressure suit of my own making, for a test flight to 25,000 feet above Denmark. It’s taken years of research, design and building in my home workshop to get to this countdown, but this is only the start, a test to prove the system for a flight into lethal territory above 63,000 feet — the “Armstrong Limit” — in Summer 2015. And these flights themselves are only tests for the larger goal, to build a functional pressure suit for Copenhagen Suborbitals’ privately-funded, DIY manned space program. Where did it start? In 2008, I started to research the history of high-altitude pressure garments — better known as “space suits.” My plan at the time was to fly as high as I could from the surface of the Earth with things that I could build myself. The simplest aircraft I could build would be a hot-air balloon, and the theoretical maximum altitude for such craft of a practical size to build would be around 50,000 feet. To survive at that altitude required not just an oxygen mask, but a bubble of pressure around the body. This could be achieved in either a pressurized capsule or, with an open gondola, a pressure suit. Since I only had my 700-square foot apartment to build in (a capsule simply wouldn’t fit through my doors) I decided on an open gondola with pressure suit. Since everything — the exact size and shape of the balloon, the life support system for a certain duration, and so on — built out from the pilot’s body, I decided to build the minimal but functional system that would maintain my life, and then the balloon to hoist it all to 50,000 feet. I learned the essentials of pressure garment design from dozens of NASA contractor reports and books on the subject. I filled notebooks with sketches, stripping the design down to the simplest principles. 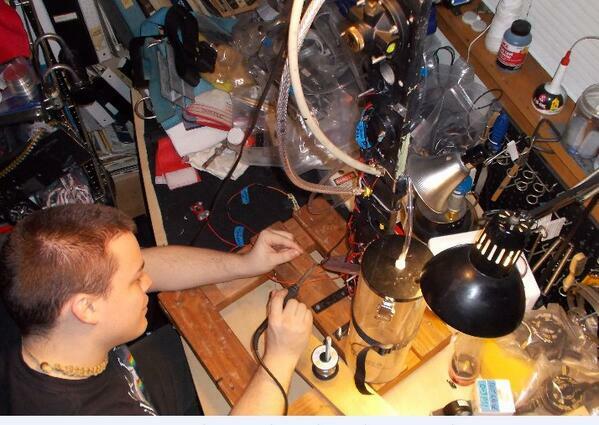 In early 2009 I started to assemble the basic materials; a gas-impermeable diving suit, various valves and hoses, and a pressure helmet leaked to eBay after the disintegration of the Soviet military system. I mounted the helmet to the suit, worked for two years killing leaks, and solved nearly all the essential problems. In 2013 I joined Copenhagen Suborbitals’ effort to put a person into space with a DIY, nonprofit design and building system. 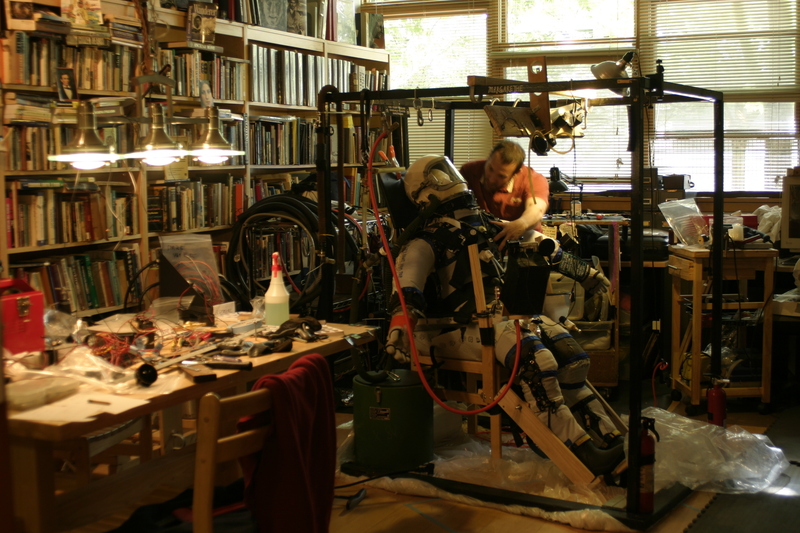 That summer we took the suit into an altitude chamber in Copenhagen and tested it at a modest simulated altitude. All checked out. 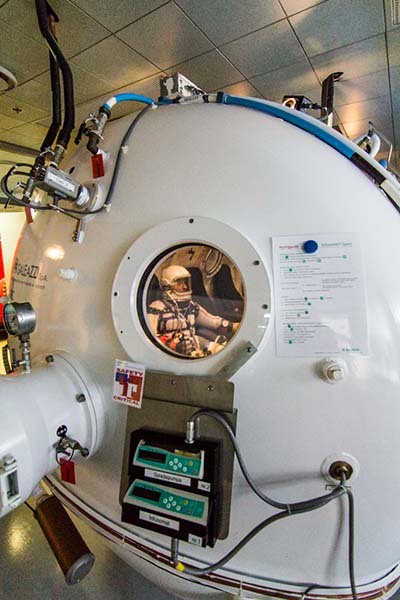 Cameron M. Smith of Pacific Spaceflight / Copenhagen Suborbitals in the Mark I ‘Gagarin’ Pressure Garment in the Copenhagen University Hospital Altitude Chamber. Photo: Jev Olsen, Copenhagen Suborbitals. I’m not an engineer; I work in essentially the opposite field from the future (humans in space) as a prehistorian at Portland State University. But by applying basic principles of research, design, and a head-banging stubbornness to solve all the basic technical issues, I got the suit to work. This summer we’ll fly to 25,000 feet in a test flight before going to 65,000 in the summer of 2015. 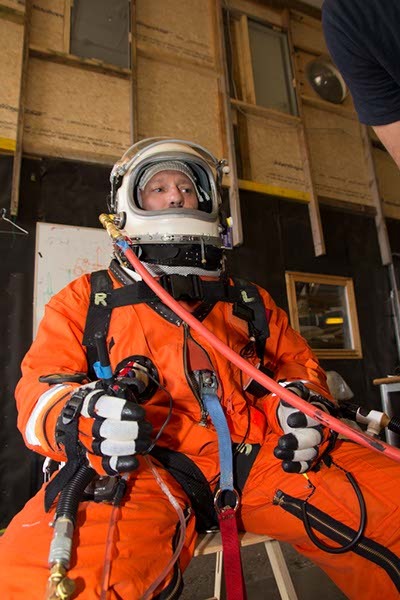 Based on these tests we can evaluate the suit and its life-support system, so we can build a 3rd-generation pressure garment for Copenhagen Suborbitals’ eventual Mercury-style suborbital space flight. Here are a few principles that have worked me to get where I’ve gotten, that I think could be helpful to others taking on a difficult project. 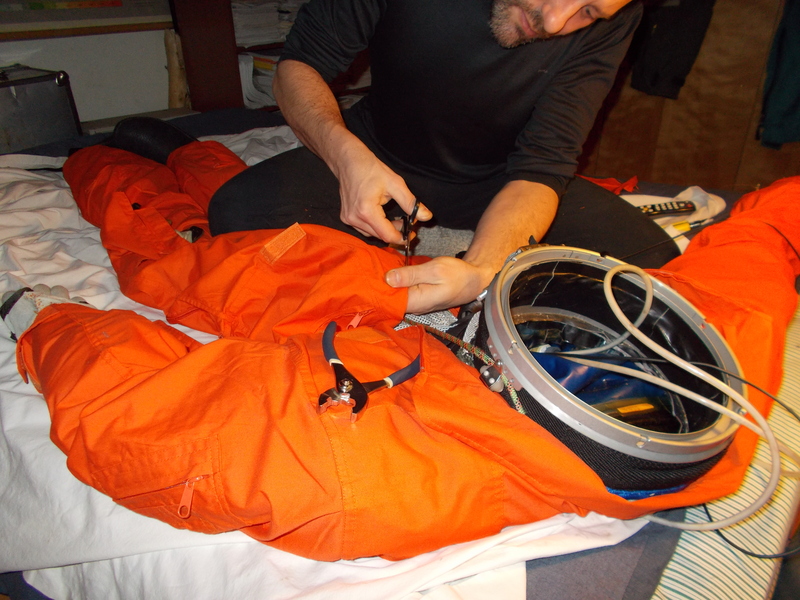 Hand-seaming on the pressure restraint garment, one of the four layers of the pressure suit. Not using a sewing machine is slow … but allows me to know every single millimeter of the suit that is meant to preserve my life at high altitude. Photo: Collection of Cameron M. Smith. It’s easy to get overwhelmed with a large and long-duration project. Though this is just one garment (we are actually working on several at the moment, but suit number one is our focus) my team and I are completely absorbed with the most minute details. There are several layers — one for cooling and heating, the pressure retention layer, the coverall, a parachute harness, and a life vest for water landings. Even before I assembled a team, I had to break the task down into manageable chunks. This allowed me to see steady progress, which is critical to maintaining morale over years of building. Even if all I could do after a night of work, was to cross off one item of dozens, at least that item was off my mind. I made dozens of to-do lists, and slowly whittled them down. If an item wasn’t working, I’d put it aside for later, and knock out something I knew I could get done. The system, with balloon gondola mockup built in my home, became too large to take on except piece by piece. Photo: Collection of Cameron M. Smith. For a long time I was bogged down, stalled by perfectionism. If I couldn’t get something up to NASA specs, I worried, what on Earth was I going to get myself into? But as I looked closer at documents from the early development of these garments, I saw my own workshop, it seemed, in the old black-and-white photos. Hose clamps and twist ties held things together just long enough to prove the concept. I zoomed in closer; glue had dripped here and there in their workshops, as it had in mine. I saw a cinder block holding up the corner of a wobbly pilot seat. I finally let go of perfectionism and started hitting my prototypes with everything I had to get them to work in a short amount of time. Rather than making yet another run to the hardware store for just the right fastener (which they might not have), I cannibalized it from a previous build. If the thing held enough pressure to test a new valve, a patch of duct tape would work for the moment. In later builds I worked out all the lumps, but the only way I moved forward was to break down my fear of getting it wrong the first time. Knocking out rapid concept proofs was a major advance, but it took quite a long time to realize it. Clunky, non-flight-rated gas fitting; but it worked to prove the system until we build the flight model. Photo: Collection of Cameron M. Smith. When working with connections — gas, liquid, electrical — getting them secured will save a lot of time. This seems counter to the rapid prototyping outlined above, but it’s the one place you can’t really mess around. 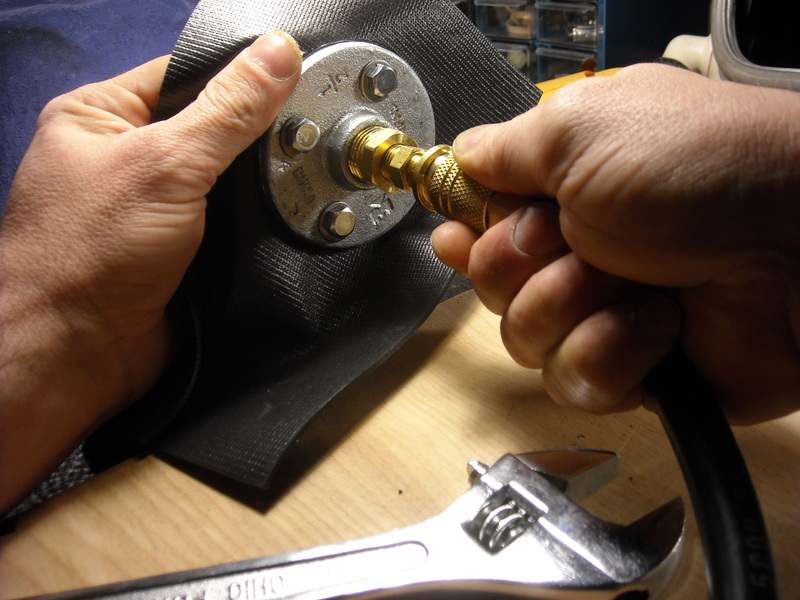 Bad fittings can slow you down as you initiate tests only to find yourself tracking down leaks or shorts. So build rapid prototypes, but if there’s one place to save time on them, in the long run, it’s in making good connections from (relatively) compatible hardware in the first place. The items on my to-do list were eventually were transferred to calendars — just printed out monthly calendars, taped into my notebook, with notes such as “30 min test 3psi” on particular days. I didn’t always make the deadlines, but I often did, and it streamlined and organized my work to compartmentalize my builds and get them to proof-of-concept form. 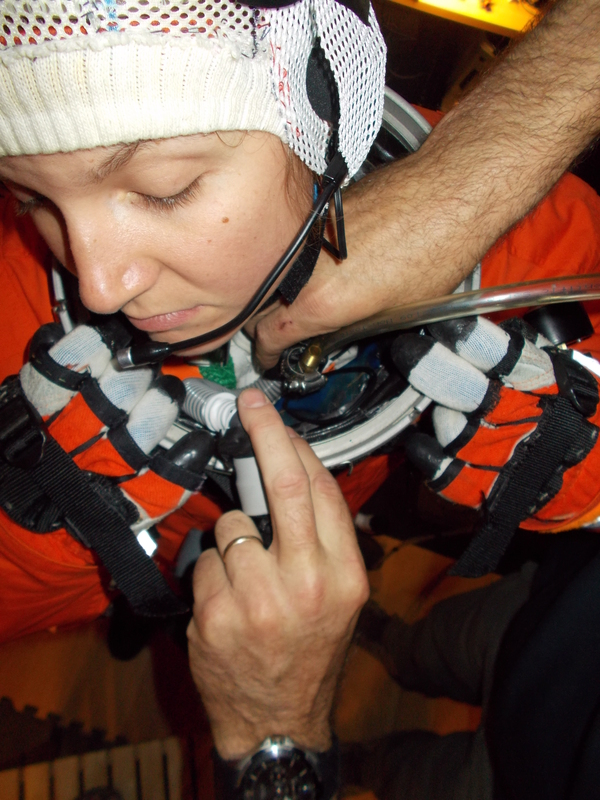 I enjoy building, but I enjoy a good test even more, one where the electrons or the gas or the coolant fluid moves smoothly through the pressure suit, keeping me breathing and at the right temperature. To get those smooth tests, I have to stick with a calendar of prioritized milestones. It took a long time to prepare for an underwater leak test, but we got to that point by sticking with a set of deadlines. Photo: collection of Cameron M. Smith. Divers are Jeff Groth and Ross Smith of the Oregon SCUBA Club. Making all of this work demanded that I pick up tools that were professional grade — or at least decent knock-offs. This goes for materials as well: I could lose a whole weekend of work by using an inferior material, or, worse, rushing the process so much that, for example, I didn’t allow an adhesive to cure just right. It was easy to go so fast with my new philosophy that I ended up taking a few steps back. Actually, learning all of this has been one of my favorite aspects of the project; now I have a decent understanding of what I need, and upgrading to the best tools and materials for the final, flight-ready models is going to be straightforward. This is pretty personal; some people can get along just fine with a crowded and messy workshop, but though that’s where I gravitate, it can cost me time when I have to hunt for the right tools. And if I can’t work on tweaking a system one night, at least I can take some time to organize my tools so I’m ready to put my hand on the right crescent wrench the moment I need it next. The suit is holding pressure, regulating temperature, providing a good flow of breathing gas. In the altitude chamber we maintained blood oxygenation, monitored with medical gear, at a pressure about a mile lower than the simulated altitude in the chamber. That’s all fine, but it’s just the basic functions. We need to reduce our carbon dioxide accumulation (via a higher gas flow through the suit and/or a simple carbon dioxide scrubber), as well as improve communications and get the suit’s materials and hardware rated for use with 100 percent aviator’s breathing oxygen. We also need to optimize the distribution of the suit’s fittings and valves with the parachute harness, flight coverall and life preserver, not to mention fitting the coverall with survival supplies in case there’a long wait between touchdown and pickup. Each of these items is a world in itself, and I’m lucky to have a team of volunteers working with me — sometimes a few nights a week, other times just on weekends — to knock out the various checklists. We are hitting these items hard, to be ready for this summer’s flight. Then we rebuild for the Big Flight in Summer 2015. More information about the suit can be found at Pacific Spaceflight, Copenhagen Orbitals, and on Cameron Smith’s web page.